The Body Snatcher (1945) was one of the last of the “horror” films produced for RKO by Val Lewton during the 1940s, which included I Walked With a Zombie, Th e Seventh Victim, and Isle of the Dead. However, The Body Snatcher is not truly a horror film, (there is no real mystery or suggestion of dark forces), and it’s only very marginally an example of film noir. It's primarily a grisly crime film set in the past. The plot, based on a short story by Robert Louis Stevenson, is set in Edinburgh in 1831, just three years after the notorious Burke and Hare murders and the subsequent sensational trial that led to their hanging. Burke and Hare had pursued the “resurrection trade”, robbing graves and selling the cadavers to doctors at the Ediburgh medical school, for whom cadavers needed for teaching were in short supply. Soon Burke and Hare had expanded their activities by murdering social outsiders and selling their bodies, too. The Body Snatcher is about the continuing activities of this practice. At the beginning of the film, a young Edinburgh medical student, Donald Fettes, meets a young woman who urgently seeks an operation for her crippled daughter. Famous surgeon Wolfe MacFarlane, the mentor of Fettes, refuses, explaining that the operation would be risky, and he can more effectively use his time to promote human health by teaching student doctors who collectively can then go out and save many times more lives. This establishes the moral compass for the film. MacFarlane, who sees things in rather cold, ends-justify-the-means terms, always seeks to act on behalf of his own vision of the greater good, even if individuals may suffer now and then. As a case in point, we soon learn that he employs a common city cabman, John Gray, to supply him with cadavers robbed from local graveyards. He justifies this practice rather matter-of-factly to young Fettes by pointing out that there are just not enough human specimens available in order to provide proper instruction to medical students. Until the law is liberalised (it would be in 1832), he must engage in this unsavory, but necessary, practice. We also learn that Gray (played by Boris Karloff) shares an unsavory past with MacFarlane that he can use for blackmail purposes. Fettes finds himself compromised into participating in these highly questionable activities, when, out of compassion for the young crippled girl, he urges Gray to go out and procure another body so that MacFarlane can prepare himself for an operation on the girl. But with graveyards more closely guarded now, Gray goes out and murders a street singer in order to supply the cadaver. When MacFarlane’s assistant, Joseph (played by Bela Lugosi), gets wind of these goings on, he goes to Gray and demands to be cut in on the take. Gray isn’t about to accept so easily, and he murders Joseph. Dr. MacFarlane now sees that Gray is out of control and goes to Gray’s apartment for a confrontation, which ends in the death of Gray. Fettes is horrified by these events, but MacFarlane assures him that with Gray out of the way, they can get back to practising medicine and serving mankind. However, MacFarlane is soon tempted to engage in his own grave robbing, and he convinces Fettes to join him. They go out to a remote graveyard on a dark and stormy night and dig up the body of an old woman to take back to the school. On the way back, MacFarlane begins hallucinating that the cadaver has somehow turned into Gray. He loses control of the carriage, which eventually goes off the road and plunges down a ravine, killing MacFarlane. Although The Body Snatcher has a number of avid fans, it falls short of the other Lewton films. With a script based on a Robert Louis Stephenson story and a solid cast, featuring Henry Daniell, Boris Karloff, and Bela Lugosi, this film should have been much better. There are three principal shortcomings. The acting. Perhaps the biggest problem of the film is the wildly over-the-top performance of Boris Karloff. He is a constantly leering and smirking bogey man, who devours far too much screen time with these antics. There is no sense of dramatic build-up when the volume is turned up full all the time and with the Karloff's character flashing evil grins at every possible turn, making Jack Nicholson’s performance in The Shining seem tame by comparison. The second biggest problem is Russell Wade, whose performance as the naive Donald Fettes is hopelessly weak and unconvincing. The story. Lewton and director Robert Wise abandoned the polarity developed in earlier Lewton films, such as I Walked With a Zombie, wherein there was an eerie tension between the rationalist point of view and that of dark magic. What they had this time instead was the moral dilemma that can occur when utilitarian-based actions conflict with social mores. Where should one draw the line? MacFarlane thought it was OK to rob graves in order to put the cadavers to a useful purpose in medical training. Would it be acceptable to kill a person in order to save additional, other lives? MacFarlane didn't go that far, of course, but there is a potential tension here that could have beeen engaged. Unfortunately, this line was not developed effectively. 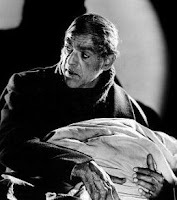 Instead, the film is loaded with Karloff’s nasty grimaces and gloomy night shots, as if that alone would compensate. There is indeed one moment in a pub when Gray and MacFarlane look into the mirror and Gray reminds the doctor that, despite his high reputation, he is really just as ignorant as everybody else. He only knows the mechanical operation of the body parts, but he doesn’t understand the truly significant aspects of living. Here we have the intriguing core issue of the film, but, unfortunately, nothing more is made of it. One further weakness of the plot: Lugosi's role is so incidental that one gets the feeling his part was artificially thrown in just to have his name on the marquee. The music. There is intrusive, noisy soundtrack music that is apparently supposed to excite the viewer during action scenes, but it is merely an annoyance. Henry Daniell gives a splendid performance as Dr. MacFarlane and almost rescues the film single-handedly. Karloff’s murder of Lugosi, which demonstrates the suffocation technique of Burke and Hare, is chilling. Since all of the other murders are done off-screen, and the cadavers are never seen in the flesh, this is the one effectively shocking moment in the film. The violent fistfight between MacFarlane and Gray in near silhouette darkness before the fireplace is well done. And we are kept from knowing just who kills whom until later. The final, deadly carriage ride with MacFarlane and the ghostly body of Gray is also effective and memorable. Director Robert Wise, who had worked with Orson Welles on Citizen Kane, also directed the over-praised, The Haunting, which I found talky, wooden, and lacking suspense. Admittedly, there were budget limitations, but I found the cinematography and film editing to be much better in other Lewton films that had similar budgetary constraints. Lewton did better with other directors.